Laser ablation (LA) coupled to inductively coupled plasma-mass spectrometry (ICP-MS) is currently regarded as a versatile tool for direct trace element and isotopic analysis of solids in a wide variety of fields, including geology and materials science as well as biology and medicine. LA consists of a laser-induced removal of material with occurrence of absorption of the laser energy and the production of a vapor plume of ablation products from the sample. This laser-generated aerosol is subsequently swept out using a gas (normally He or Ar) and introduced into the ICP-MS for atomization/excitation/ionization and detection. Most commonly, LA-ICP-MS analysis does not require any sample preparation and it can be considered as a quasi-non-destructive technique. Among the most interesting and growing research areas of LA-ICP-MS, we can find the development of new strategies for elemental and isotopic imaging studies, i.e., knowledge of heteroatom (detected by ICP-MS) distributions along micrometer structures of solid samples. Particularly interesting are those applications related to the distribution of heteroatoms in thin tissue sections of biological samples. In this vein, imaging analytical techniques with high spatial resolution are today of crucial interest in life science studies to achieve a deeper understanding of the role of heteroatoms in biological systems (e.g., to study the accumulation of metals in selected regions and to compare the differences of the metals distribution between non-pathogenic and pathogenic tissues) as well as to provide important information about human evolution, palaeoenvironmental reconstructions, and provenance (e.g., by measuring natural isotopic abundances and isotope ratio variations). Concerning biological tissues, last advances are related to obtain molecular information as well: the localization of sought proteins in the thin tissue sections. In such case, 2D images of specific proteins can be obtained in biological tissues by LA-ICP-MS after an immunohistochemistry (IHC) protocol with metal-labeled antibodies, constituting an interesting alternative to commonly used fluorescence detection and opening new perspectives in specific and high multiplexing protein analysis. Single metal chelates, polymers containing several chelates, and metal nanoparticles have been proposed as chemical reporters to label the antibody to be used in the IHC reaction. On the other hand, it should be stated that although obtaining LA-ICP-MS qualitative images (intensity signals in count per second) is nowadays relatively simple, the quantification step (necessary to determine the concentration of the selected heteroatoms) is still a controversial aspect. The inhomogeneity of the samples and the absence of certified reference materials with a matrix similar to the sample’s matrix limit the development of universal calibration methods for LA-ICP-MS imaging. Thus, different analytical methodologies can be currently found in the literature. 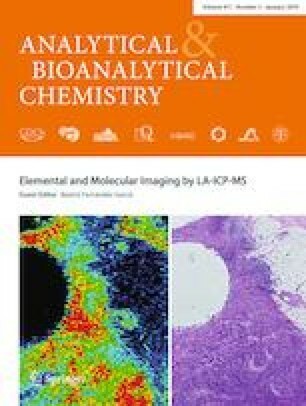 This topical collection of articles includes representative works related to different aspects of LA-ICP-MS imaging, such as fundamental studies for minimizing errors in the experimental measurements, the development of new quantification strategies based on the use of micro-droplets, and elemental, isotopic, and molecular imaging studies. Thus, the review and original research papers in this collection give an insight into present research efforts in the field of LA-ICP-MS imaging. Interesting approaches related to elemental imaging were reported to visualize Li, Mn, Ni, and Li from lithium-ion batteries, helping to understand the mechanisms of transition metal dissolution in this type of device. Also elemental imaging in biological tissue sections was presented through the quantitative imaging of Br in zebrafish tissue sections to study the uptake kinetics of Br contained in an organophosphate compound used for supplementation. Gd imaging was performed in several mouse organs with regard to three different Gd-based contrast agents currently employed for clinical investigation: the different distribution of Gd found by LA-ICP-MS in the organism could yield important insights into the fates and distributions of these species. In another original research contribution, the spatial distribution of 87Sr/86Sr isotope signature was determined in biogenic areas on the bone cross section of human femur samples from archeological excavations. Concerning molecular imaging, two original research papers demonstrating the potential of LA-ICP-MS combined to IHC protocols were also tackled in the topical collection. Particularly, Au nanoparticle IHC assays were employed combined with LA-ICP-MS for the localization of immunoglobulin G and matrix metalloproteinase MMP-11 proteins in polyvinylidene fluoride membranes and human breast cancer tissues, respectively. High amplification and quantification capabilities are the main advantages brought about by such a combination, demonstrating that protein imaging by LA-ICP-MS may be a useful tool to provide new insights into biological processes. In addition, a tutorial review addressing latest progress based on the use of metal-labeled antibodies for LA-ICP-MS imaging of proteins is collected. In that review, critical requirements to obtain absolute quantitative imaging of specific proteins by LA-ICP-MS are highlighted. Finally, I would like to thank all authors for submitting their valuable work for this topical collection as well as the contributions of referees. It would not be possible to achieve such a high quality without their careful review and constructive criticisms. Furthermore, I would like to thank also to the Editorial Office and Editors for their friendly and timely support. I hope that this topical collection will serve as a valuable source of information on the state-of-art in imaging analysis by LA-ICP-MS for newcomers to the field as well as experts.